Just a little update after the quiz on Thursday. With all of your help we managed to raise £1025, smashing the £2300 target, totalling £2900 overall! An absolutely staggering amount. I can’t thank you all enough for your kindness and generosity. A massive thank you again to Jane, Debbie, Barry, Izzy, Alex Gibson and Steve Hopper for helping with logistics. Also thanks to Howard in the kitchen and the bar staff. Thanks to the Gourmet Deli Co. John Barry salon, Wild Health, and everyone that donated gifts for the raffle. Now all I have to do is run 26 miles, can’t be that hard right? Hope you all have a wonderful week! 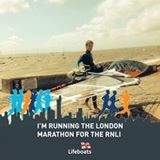 Thanks again for supporting the RNLI. Postponed Border Force Presentation – Tuesday Evening 8pm! UKBF presentation – TBYC 29/01 – due to the current level of uncertainty and Met Office severe weather warning that has been put in place regarding potential travel disruption in Kent, London & Essex areas for this evening the UK Border Force presentation has now been rescheduled for Tuesday 12th March at 20:00hrs at TBYC. UK Border Force Officers will be giving a presentation about their work in the main bar, this Tuesday evening (29th Jan) at 8pm. Come along and find out about the fascinating work they do! Winter series costs will be as per club winter storage rates for club members, £80 for non members. Even if you do intent to complete, be available to move your boats on the 7th for a work party to replace some hawsers and to allow room for cruisers and sandhoppers, it is your responsibility to ensure that your boat is adequately secured. It’s Cadet Night this Friday 22nd June. David Elkington will be sharing some valuable first aid basics from 7pm! Open to all! Entries need to be in by Friday 25th May 2018, so only one week left, please get your forms into Janet this week to avoid disappointment, place are filling up fast. Remember to check who you are sailing with and what your sail number is to help us organise the boats and groups over the next couple of weeks.